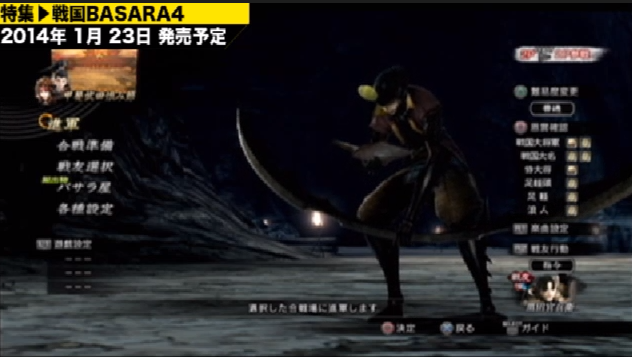 Capcom's lighthearted Hagi-Toko show included some Sengoku Basara 4 content today, so I rushed to Ustream to check it out. I don't have a premium Ustream account so the quality was horrible and ads kept interrupting my stream, however I still found it a very rewarding watch. After the usual introduction where Geist Crusher was promoted, Sengoku Basara 4 director YamamotoD arrived and the show went straight into a gameplay demonstration with a level 51 Gotou Matabee. His battle comrade was Kanbee, of course. Matabee's element is now officially confirmed as lighting, I'd say. 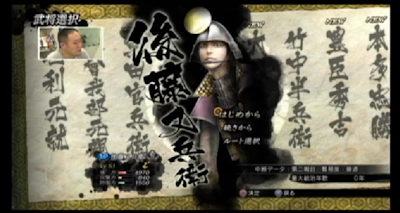 The characters on the Sengoku Creation selection screen are - in order from left to right - Motonari, Motochika, Kanbee, Matabee, Yoshitsugu, Hanbee, Hideyoshi and Tadakatsu. There are four difficulties to choose from in this version of the game. 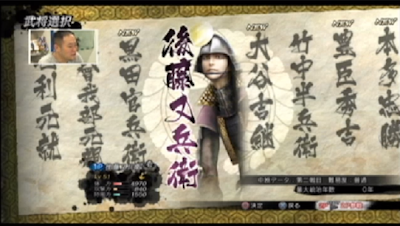 You can see that it's blurry but the options are Normal, Hard, Extreme or Basara from top to bottom. Matabee chats with one of his ronin soldiers on the march screen. The hosts were trying to imitate his weird chuckle. The first stage they considered was a Yoshiteru level. The name was far too small and blurry to read, but it looked as though it was a less dramatic variant of the Eiroku Palace stage. They then switched to a rearranged version of Kai: Tsutsujigasaki Yakata called Kai Takeda Grudge Time. It was set up as an 'intrusion' battle between the Takeda and Ii forces with Yukimura and Naotora having a confrontation in the middle. 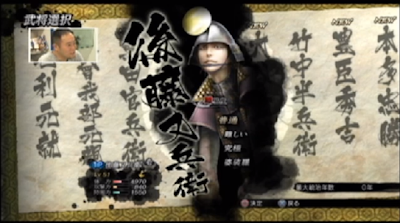 The player faces Sasuke, then Naotora, and finally continues through the stage to reach Yukimura in the room full of fire (as seen in a lot of TGS 2013 demos). This shot was taken just before they started, showing Matabee furiously consulting his Matabee Enmachou mark book. When it came to the gameplay, they did quite well, I saw Matabee rank up to second highest level just by playing normally (I might have missed them getting higher during the ads). 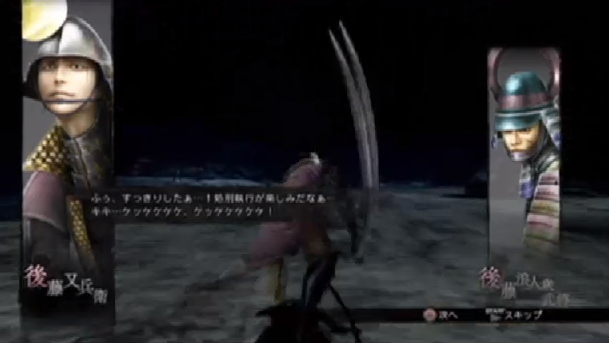 We got to see his normal Basara skill, and also his Giga Basara. Kanbee's seems to be a splash of water (or tea? 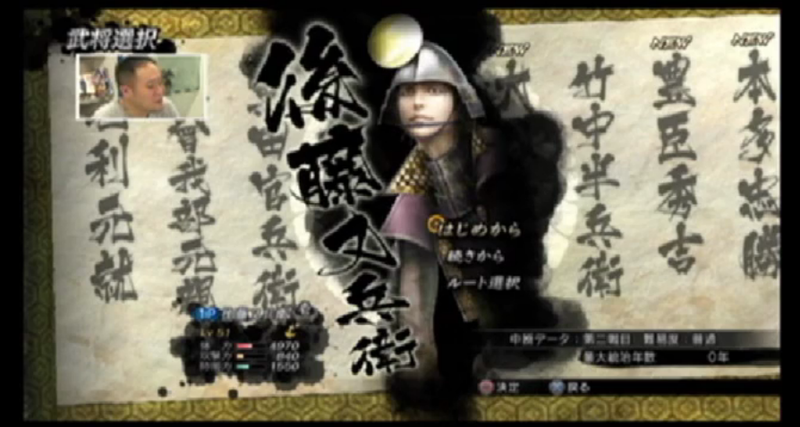 ), presumably a direct reference to his 'Josui' name which also serves as his two-character Basara-e title. Matabee's dinosaur artwork is much easier to understand. His Basara-e title is 'Roaring Dragon' - which happens to be pronounced a little like 'dinosaur' in Japanese. There was then some brief discussion. Yamamoto mentioned that he would be working on the game over Christmas but he's getting Christmas Day off. It was also confirmed that there will eventually be other DLC available besides costumes. Many Japanese fans are hoping that this means both characters and stages. The other noteworthy remark was that regional warlords are taking a break this time - that means that we're unlikely to see Yoritsuna, Hirotsuna, Harumasa or Yoshishige in the game. There's been speculation that Amago Haruhisa is still a possibility since he features so heavily in Shikanosuke's story. The rest of the Hagi-Toko show covered other Capcom games such as Cross x Beats and Monster Hunter 4. The next live broadcasts are just a few days away. Update: Blogger @masa1567 observed that there was another option on the Sengoku Creation Mode screen before the difficulty selection. From top to bottom, these options let you decide to play from the start, continue your game or choose your route. This last one implies that you can freely change between the normal, anime or drama routes. I was able to watch the stream again and take a picture since it was uploaded to Nico Nico Douga in two parts. These videos could be taken down at any time. 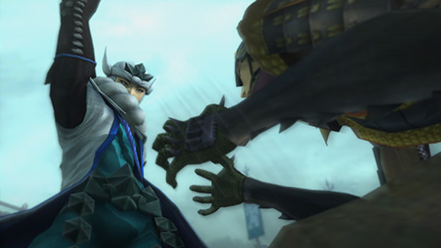 Information about the Sengoku Basara 4 EP music CD will be announced on Monday? I saw an alert on Twitter on Friday morning advising that Capcom had posted information dated next Monday about a 'split' single CD for the game's theme songs titled Count ZERO | Runners high ~Sengoku Basara 4 EP~. By the time I clicked the link to Capcom's information site, however, the post was gone. This wouldn't be the first time that someone has accidentally posted an article earlier than planned and swiftly removed it, and it would make a lot of sense for them to announce the CD around now anyway, especially since it's rumoured to be coming out on 12th February 2014 with two versions to collect. I'm going to assume that we'll have the full release information on Monday morning. Will you be in Sapporo between 21st December 2013 and 3rd January 2014? 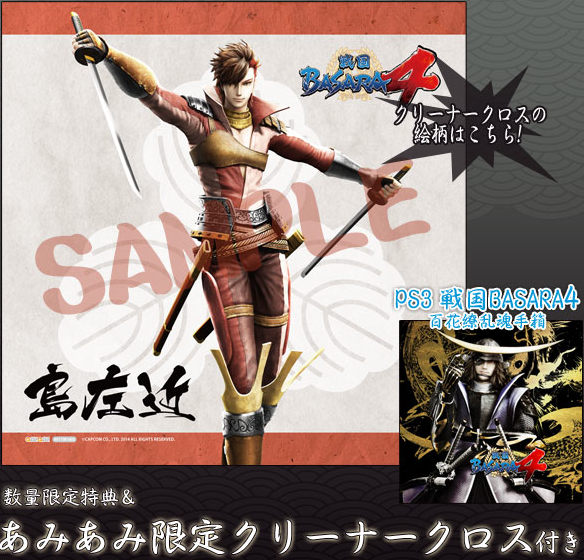 I'm guessing that most readers of this blog won't, but those who live nearby have an opportunity to pick up some Sengoku Basara 4 merchandise from a special pop-up shop on the seventh floor of Daimaru. Other Capcom games will be represented as well. 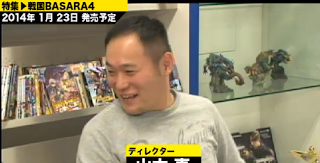 The stock looks very similar to that of the official Capcom shop in Odaiba. This remark is completely out of place, however I just remembered that a few major game news sites have been speculating that the new picture of Kenshin and Matabee having some kind of confrontation is because Kenshin is one of the names listed in Matabee's mark book. If so, we probably know all three of the people who are his main targets: Masamune, Ieyasu and Kenshin. I'm surprised that Kojuurou isn't there too (unless he's bundled in with Masamune). And finally, my translation guide has officially become too large for a single blog post (there's a lot of formatting for the tables which makes it impossible to save updates any more). So I've split it into two parts. For now, the first covers the menus and tables while the second is a compilation of the characters, formations and information links. I've added translations for the in-battle pause menu and controller settings page in the 'Navigation' section since we got a glimpse of both on Thursday; fascinatingly there seems to be a 'Fugitive Bingo Book' which you access by pressing Triangle when the game is paused. Though I'm still not quite sure where this fugitive collection system is going, it sounds potentially interesting after the tedious Sengoku Basara 3 fugitive hunting madness. I was impressed seeing that dark cloud of mist Matabee created by spinning around his boomerang blade thing. I wonder if it actually zaps enemies with those lightening sparks. I kind of want to avoid spoilers now but it's so interesting. I both want to see everyone's ink art and not see it. So Matabei got one big old-fashioned chunky t-rex, he seems more like a little aggro velociraptor to me. 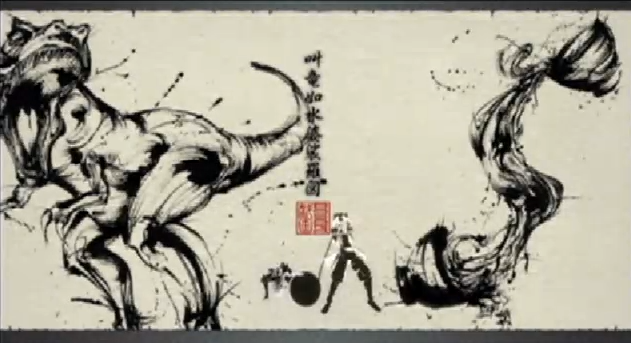 Kanbei's art just looks like a brush stroke - (but WHYYYYYY) How fitting that it's nothing impressive. Haha, I know how you feel. I want Capcom to take command and deliberately conceal some parts of the game to stop me being too greedy about watching everything I can. Perhaps they can show Hanbee and Hideyoshi next. I've been wanting to see both of them in action properly, and it won't spoil their Basara-e illustrations since we've already seen them before. What I thought as well at first glance. To match with Kanbee's bad luck. Aww they won't even upgrade you to reward you for ordering from them in the first place?